Kelsie Anderson is from the great Hoosier state and is still trying to figure out how she got here. 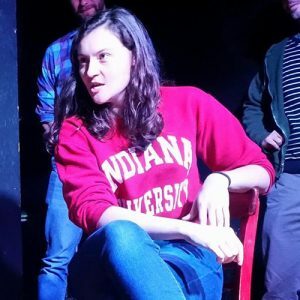 Kelsie started taking improv classes at WIT in 2016 because she was told that people needed hobbies. Like most of her previous hobbies, she has probably taken this one too far. She performs with the indie teams The High-Fivers, CAKE, and Rancy Neagan. In addition to improv, Kelsie also writes and performs sketch comedy at Dojo with Deer Friends. She created and runs the DC comedy blog Comedic Pursuits because she apparently hates having free time. The moon. She's seen everything.